Do you want to extend the living space of your home through the use of your patio with style, functionality, and affordability? Installing a sliding glass patio door will increase the enjoyment value of your home, allowing versatile, seamless transition between your interior and exterior spaces. Whether you're looking to brighten up your home's interior natural lighting by installing new sliding patio doors, or you need to replace old, weathered or cracked sliding doors, All City Construction and Remodeling offers a wide range of beautiful patio doors to choose from. Our glass door experts have over 20 years of experience working with homeowners to create the best space suited to each homeowner's unique needs and style. Call (310) 504-2231 today to schedule a consultation and estimate with one of your experienced field crew members! 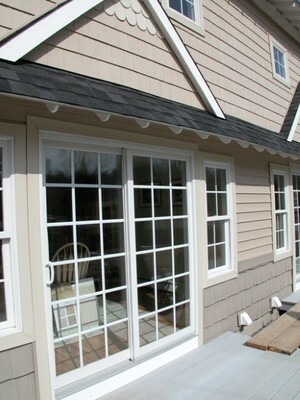 Why Install or Replace Your Patio Doors? Energy Efficiency - State-of-the-art thermal efficiency ensures tight weather seals and decreased home energy costs. Low Maintenance - Vinyl & Fiberglass cladding means no painting and minimal maintenance costs. Simple cleaning only! Increased Quality of Home Life - Enjoy your outdoor and indoor spaces at the same time, as you intended! Aesthetic Value and Curb Appeal - Beautiful new sliding patio doors mean you will be the envy of your neighbors. Increased Property Value - Decreased energy costs and increased curb appeal! When it comes to your own individual preferences for your new sliding patio doors, All City Construction and Remodeling has many options and suggestions to choose from, and has been assisting homeowners in making their patio spaces stand out since 1999. Choose from vinyl, wood, aluminum, steel, or fiberglass sliding doors, with further options to incorporate low energy glass, decorative glass, built-in blinds and grids, and many other options! All of our sliding glass patio doors are custom manufactured and installed by All City Construction and Remodeling. Call (310) 504-2231 to speak with the sliding patio door experts at All City Construction and Remodeling today! As sliding patio doors are typically installed on the ground level of a home, security is a major factor. All City Construction and Remodeling offers both dual point and four point locking systems for your new sliding glass doors, ensuring your home is safe and protected from unauthorized entry. Our trusted installers have been recommending and installing the proper security features for homeowners' new sliding patio doors for over 20 years.